The Dry Creek trail is located in the Plateau Division of the Uncompahgre National Forest near Montrose, Colorado. The south end of the trail begins off of Forest Road #524 where it travels through the forest for a little more than a mile and a half before descending into the Dry Creek drainage. 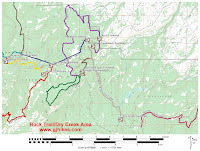 After another mile and a half the trail comes to a junction with the Dry Creek Spur trail where it crosses the creek and begins a moderate climb that takes it up to its northern end at a junction with the Buck trail and Forest Road #560. This post begins at the south end of the trail where Forest Road #524 departs from the Divide Road. To get there from Montrose follow the Dave Wood Road and turn right onto the Divide Road measuring about 21 miles from Townsend and Main. Continue on the Divide Road for about 8.5 miles where FR #524 will be on the right. There is room to park on both sides of FR #524 after a few hundred feet that can accommodate vehicles pulling trailers. The Dry Creek trail doesn't begin until you travel about 3/4 of a mile down FR #524. The only suitable parking is way back near the Divide Road so you pretty much have to add 1.5 miles to the total round trip distance. If all you want to do is the Dry Creek trail itself then it is better to begin at the northern trailhead at the end of Forest Road #560. As the Dry Creek trail starts out it is a little rough at first. Rocks on the Plateau tend to break off into chunks with squarish corners so whenever you come to a stretch of trail where the soil is thin it tends to be a bit rough. For the most part though the first mile and a half stretch is smooth sailing and very pleasant. Right around the two and a quarter mile point from Divide Road the trail passes between a couple of wooden posts and begins its descent into the Dry Creek drainage. Much of the trail at this point is pretty rocky and it gets steeper as it goes. The trail loses about 300 feet of elevation within a distance of a half mile. That isn't all that steep as far as Colorado trails go but with most of it being rocky it makes it seem a lot worse. When we were hiking the Dry Creek trail on the day we took the photos for this post it was right in the middle of the Archery and Muzzleloader hunting seasons. We saw a few tracks as we were coming down the hill but didn't think anything about it until we started hearing a few cow elk chirping across the creek. We could hear the cows but all we could actually see was this bull. It was only about a hundred feet away when we first saw it but by the time we changed lenses and began manually focusing it so we could shoot past the trees in the foreground it had moved off another 50-100 feet. It never did see us or it would have disappeared in a flash. All the tracks that we saw from hunters had ended at the top of the hill. At the bottom of the hill the trail crosses the creek and climbs up the mountain a bit on the other side. From there it gets really pleasant as it continues through the trees and a few open meadows. Just under the 4 mile point the Dry Creek Spur trail makes a connection on the left. The Dry Creek Spur trail makes a very steep climb up the mountain and comes out on the Divide Road. After crossing the creek the Dry Creek trail climbs off in the other direction but on a much more moderate grade. As the trail is climbing back out of the drainage it passes a scenic little reservoir that is a perfect setting for a rest stop. As the Dry Creek trail comes to an end it passes the start of the Buck trail. 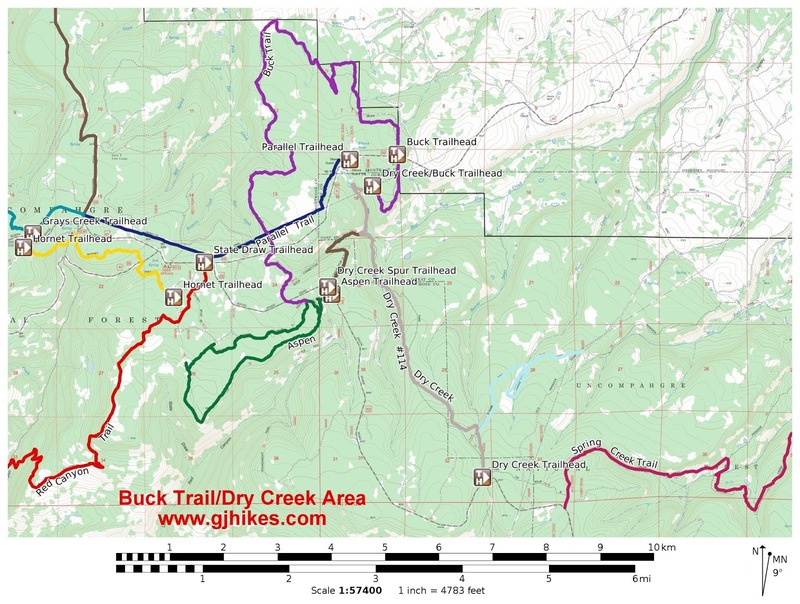 The Buck trail is a singletrack that is open to dirt bikes but not an option for ATVs. While the Dry Creek trail probably gets most of its use from ATVs we did see some recent mountain bike tracks and boot tracks. The boot tracks appeared to be from hunters. Most of them either hiked part way in from either trailhead or rode an ATV part way and then started off on foot. None of them went far enough to get to where the elk were hanging out on the day that we were there. For those that like spending their summer days exploring the forest the Dry Creek trail is a nice option. If you would like to see it for yourself then all you have to do is 'Take a hike'.